My girlfriend was ill with a nasty cold last week and my punishment, for not looking after her better, was to get the cold myself. Obviously, being a guy, mine was ten times worse and forced me to take 2 days off work. I also didn’t run for 4 days as a result. Just before I felt it coming on I did my biggest run so far (and ever). After this it would mean tapering down all the way to the marathon. The 20 miles took me 3 hours 20 minutes. Again, not a great time but at least I managed to squeeze an extra mile in to that time slot. I’d prepared well for the run. 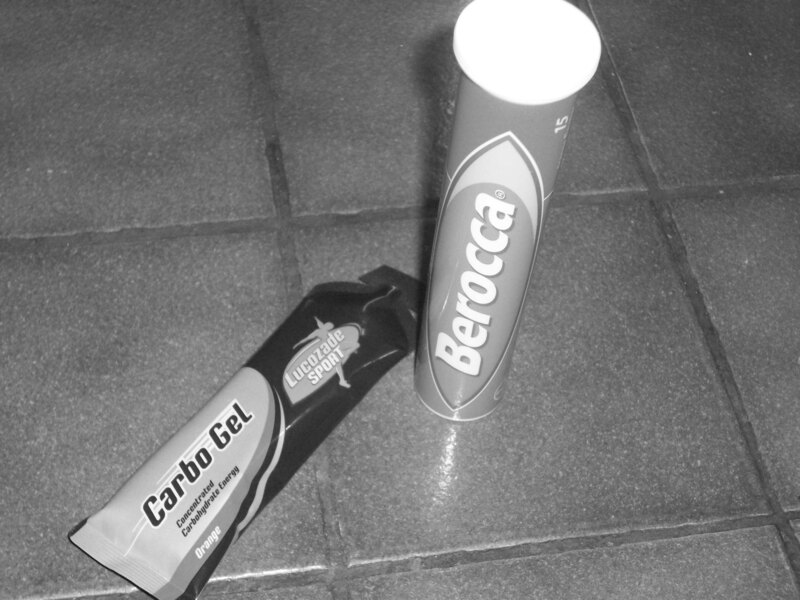 I’d had beans on brown toast for breakfast and this time I’d taken 3 carbo gels with me that I’d bought the day before from the London Marathon shopin Covent Garden. To be honest, I didn’t really feel any effect after taking them. It was a pretty hot day during the run and I had to ration the water in the bottle I was carrying as it’s not very big. Apparently it’s important to get your water intake right while taking the gels so maybe this had something to do with it but I still felt knackered at the end and couldn’t keep a decent pace. In hindsight, this is probably because I was on the verge of the WORST COLD EVER, and I’ll finish the marathon (I’m sure of it) but I really don’t think I’m going to be able to complete it in under 4 hours. This, coupled with the fact that being ill has stopped my training, has meant that this has been a tough week. I’d wanted to keep training so badly during these past couple of days (especially as the marathon is now less than 3 weeks away). I nearly followed the ‘neck rule‘; if your ailment is above the neck (sniffles, head colds, ear infections) then running will most likely not do you any harm and if your ailment is below the neck (injury, coughs, stomach aches) then running won’t do you any good. I’m not sure if there is any scientific theory behind this rule but I rested up nonetheless. Apparently, the volume of runners that pull out of the marathon due to illness is quite high. Here’s a fact that’ll put a smile on couch potatoes across the land. Endurance training causes a rise in the hormone cortisol which causes stress. This stress can affect the immune system, which can make you more susceptible to infection! So basically, because I’m eating better and exercising more, I’m more likely to get a cold than Fatty McFatterson of Cheeseburger Land! Of course, I’m exaggerating (I’m not well). The key difference is the volume of exercise. Running for anything longer than 90 minutes causes blood sugar levels to drop to a level where this hormone is more prevalent. Marathon runners exceed this regularly in training and as a result, towards the end of their training, many marathoners pick up a cold. 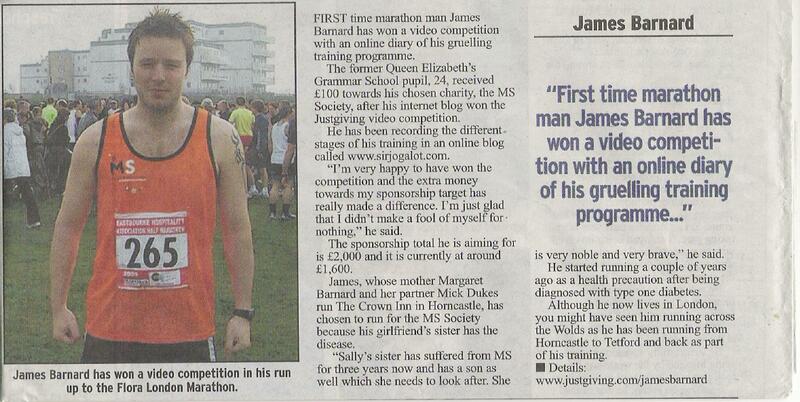 After winning the Justgiving video competition, I thought that the story behind it would be of suitable interest to my local media. I’ve been trying to come with an angle other than you might know this guy, he’s running the marathon and this was it. The first thing I did was to get the news desk email addresses of my local press, the Horncastle News and the Lincolnshire Echo. Easy, I work for a media contacts database for the PR industry, but finding them out really isn’t hard. 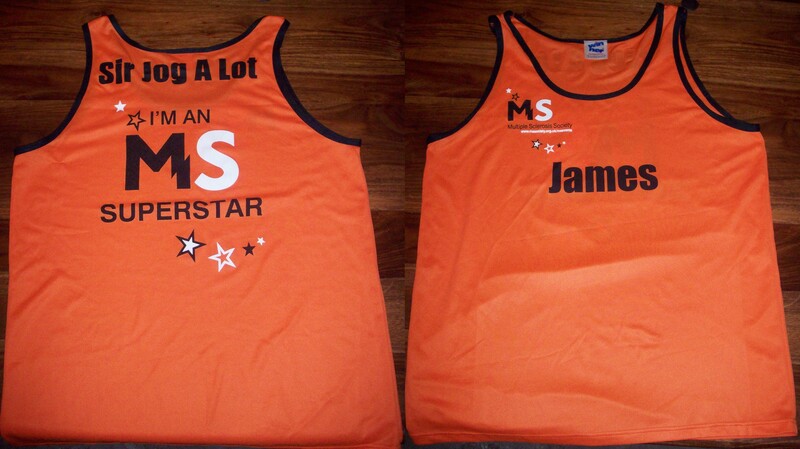 James (24) is running the Flora London Marathon 2009 in April for his girlfriend’s sister, Katie, who suffers from multiple sclerosis. This is a little trickier as journalists get thousands of emails every day, which clog up their inboxes. In my case I gave my contact details if they wanted one but you can just as easily host one on the internet using Flickr or Photobox and provide a link to it. This way they won’t have to download your high-res image in their email. I might follow up with another email in a couple of days time if you haven’t heard anything back, chances are that they are too busy to respond. However, usually this means that they’ve seen your press release and deleted it. Don’t feel too disheartened. Journalists are always short of time, always on deadline and will discard most things that aren’t breaking news. The circulation of the Horncastle News is 5,190. Not bad. You could try and get a celebrity tweeter to mention your page and get it in front of half-a-million viewers, but who’s counting? My running vest has arrived back. A fellow blogger, Becki Ellsmore, tweeted up her services as a running-top printer a few weeks back. The price? A hell of a lot better than the official printing service offered up by the London Marathon website. Plus all of the proceeds go to the charity she’s running for, Save The Rhino International. This is the first real bit of blog-on-blog loving I’ve done really and I feel a little ashamed. This is because without the help of my fellow FLM bloggers I don’t think this blog would have been nearly as popular (achieving 1000 hits per month now). A special mention to Becki, Tom, Dan and Phil (who does a great round-up of marathon blogs on the weekend). I’m not that generous really though. Every one of the pages I’ve just linked to has a link back to my blog in it! Reciprocal.